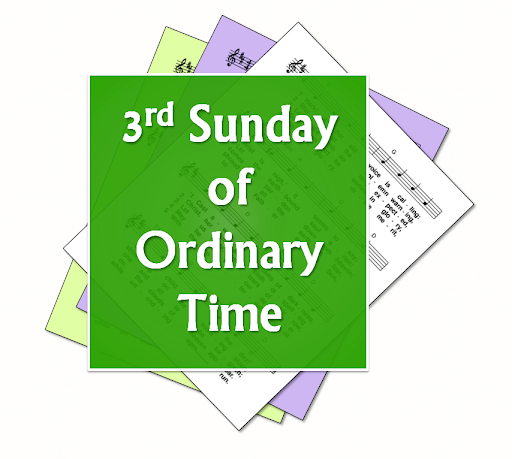 A selection of hymns and songs, based on themes from the Roman Catholic lectionary for the third Sunday of Ordinary Time, Year B. First: Jonah - The Lord sends Jonah to preach in Nineveh - the people were converted and God repented and did not inflict on them the disaster he had threatened. Psalm: 24 - Lord make me know your ways / Remember your mercy Lord / The Lord is good and upright. Second: I Corinthians 7 - Our time is growing short ... the world as we know it is passing away. Gospel: Mark - Jesus calls the fishermen Simon and Andrew, and James and John - to follow him. God teaches us his ways. Come, follow me. Jesus teaching repentance, as Jonah did.